What is a Telescoping boom Crane? 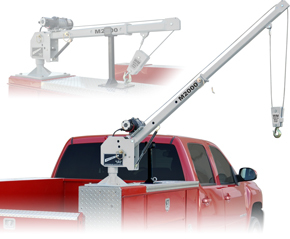 Be sure to check out our new M2000, which features a gas-spring lift-assisted boom! A Western Mule Telescoping Boom Crane is an overbuilt, yet very compact, lifting device that can tackle heavy loads without taking up a lot of valuable cargo space. Adjustable boom elevation and reach means you can set the lifting point right where you need it.